Quilters love to collect fat quarters for their stash with the hopes of finding just the right pattern at some future date. 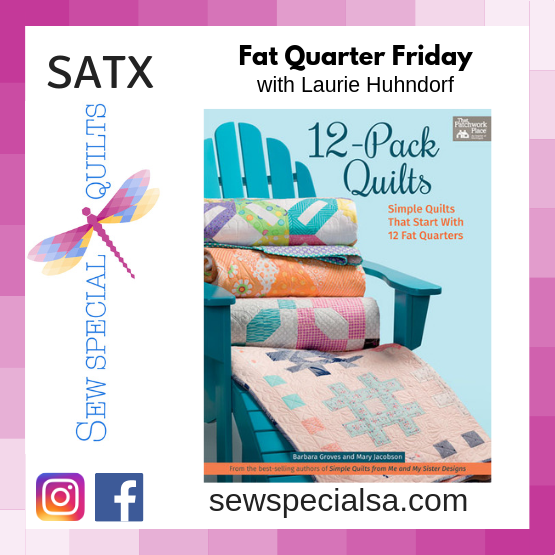 Now is the time to pull out your fat quarter stash and create a fun quilt each month this year. Finished size 82.5" x 82.5"
12-Pack Quilts: Simple Quilts that Start with 12 Fat Quarters by Barbara Groves, Mary Jacobson PURCHASED FROM SEW SPECIAL QUILTS. Recommend the Creative Grids Stripology Ruler to make cutting easier and faster! There are NO REFUNDS for class cancellations. You may receive a store credit when you cancel 72 hours before the scheduled class if we can fill your spot. Store Credit cannot be given on No Shows. 12-Pack Quilts Book PURCHASED FROM SEW SPECIAL QUILTS. 15% Off All Class Supplies Purchased from Sew Special Quilts.